Last December we looked at the Forest Glen station and asked you for insights on why people coming from so close (less than three miles) would drive to the station. In the upcoming weeks we are taking a look at five additional stations that also have a high percent of short-distance parking access and low bicycle use: Southern Ave, Glenmont, Largo Town Center, and Grosvenor-Strathmore. For each, we will explore the station’s local conditions and we ask you to share your insights about what can be done to improve walking and biking access to these stations. 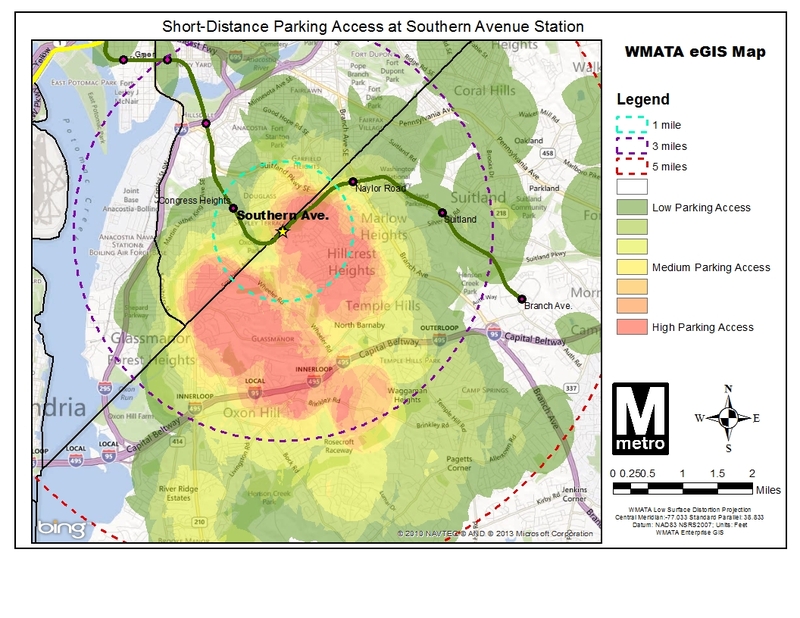 The map on the right (full version) shows auto access “hotspots” around Southern Ave station. The Southern Ave station is located just southeast of the boundary between the District of Columbia and Prince George’s County. 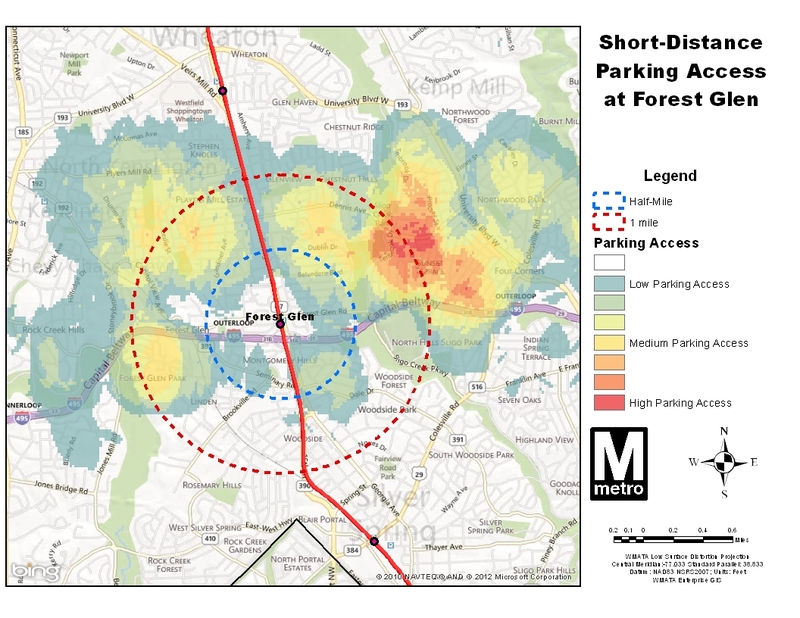 Many residential neighborhoods are located within the three-mile radius of the station, and a large concentration of parking users residing within one mile of the station. Southern Ave SE is a fast-moving, four-lane road that is uninviting to pedestrians, despite traffic signals, sidewalks and streetlights. WalkScore.com gives the Southern Ave Metrorail station a walk score of 52 out of a possible 100. The station has no direct connectivity to the surrounding residential neighborhoods. All access to the station must occur via Southern Ave SE. 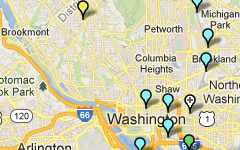 As such, many neighbors of the station must travel long and circuitous routes to access Metrorail. See the image below. The station nestled into a corner of Oxon Run Park, further limiting station access routes for nearby residents. 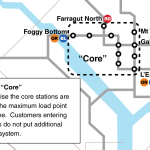 Metro is focused on solving one of the region’s most pressing mobility issues – increasing the capacity of the system to handle more trips through the core (defined below) of the Metrorail system. While Metro’s planning staff has been conducting technical analyses and searching for the best solutions for some time, we also asked for ideas for increasing core capacity from you as well as discussed the potential for new lines, new connections and expanding to all 8-car trains during peak periods. There are also operational strategies Metro could employ to provide more trips on the rail system without expanding capacity. Among the various options is to promote and encourage more “reverse commuting” where commuters travel opposite the peak travel direction in seats that would otherwise be empty. Data show that reverse commuting has already increased over the past 10 years and many speculate that it will only increase further as the region builds more suburban town centers near Metro and as Metro begins operations on the Silver Line later this year. The Forest Glen station is located north of the Capital Beltway and west of Georgia Avenue. 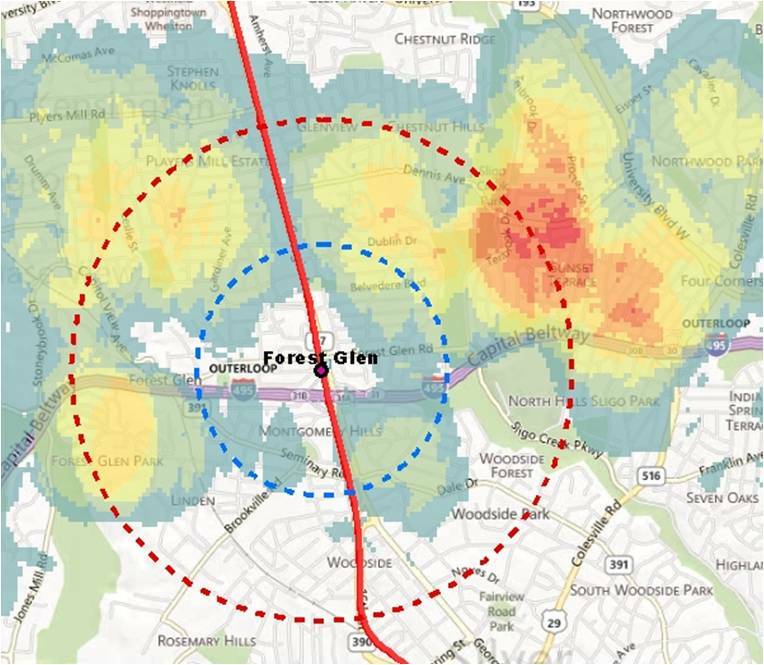 More commuters to Forest Glen are from north of the Beltway and east of Georgia Avenue. There is pedestrian overpass over the Capital Beltway which helps facilitate foot traffic: Is crossing Georgia Ave then a barrier? There are four Metro rail stations located within a 2-mile radius of Forest Glen which draw away commuters farther from the station. This could help to explain the highly localized nature of the parking shed. There are many factors not considered here such as demographics, bus usage, and average driving trends. Further research into parking and commuting trends is in the works. 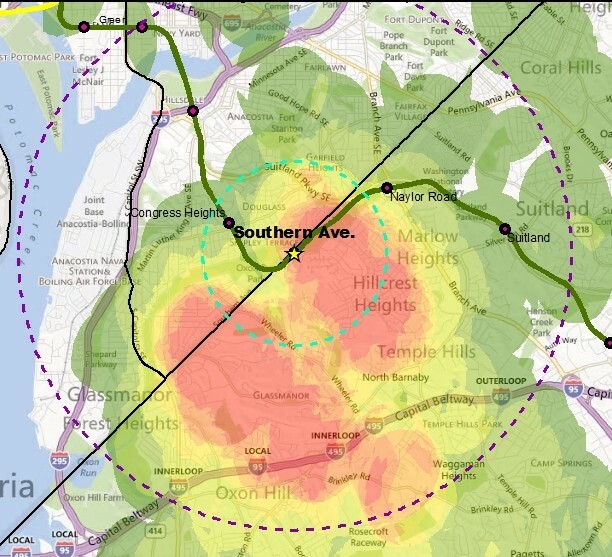 If you commute from this area, can you comment about what you experience on your commute? Do you drive? If so, what factors influence you to drive instead of walk or bike? Would you like to walk or bike, but the infrastructure isn’t there or the traffic is too daunting? Or do you see something else from this data? We want to hear from you and appreciate any feedback you have that can make our system more accessible to pedestrians and cyclists. A few weeks ago we posted a video visualization of one day’s worth of Metrorail, Metrobus and Circulator created by STLTransit. Upon first seeing this video, contacted them to thank them for their work and also asked whether the Metrorail could be made to stand out more in the video, to differentiate it from Metrobus and Circulator. This morning, I received a link the updated video embedded below, a great improvement. Metrorail trains are now shown as “tadpoles” instead of dots, which allows them to be more visible and better represents the carrying capacity of a train (800+ people) versus a bus (60+). Check it out. It looks best in HD mode full-screen. 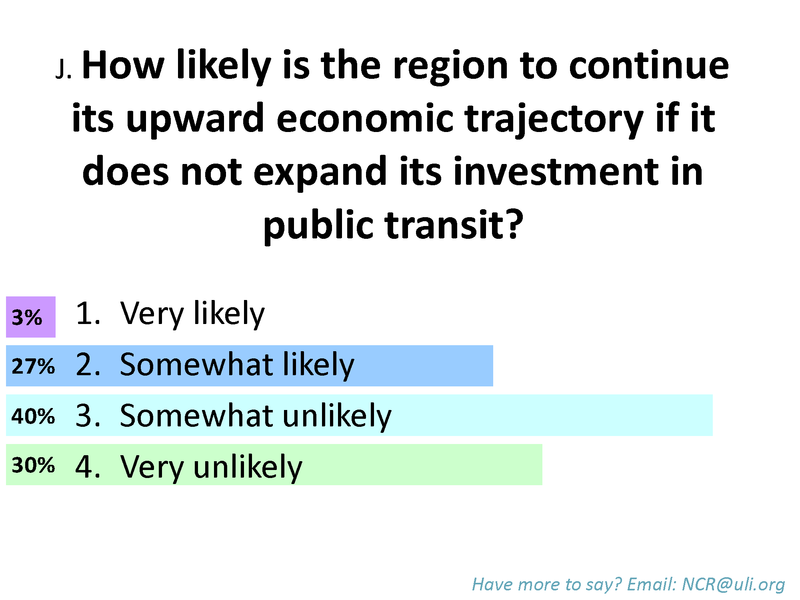 70% of the participants felt that expanded investment in public transit is key to continued economic growth in the Washington region. Over the past decade there have been many significant efforts to promote regionalism in the National Capital region.Endeavors including Reality Check, COG’s Region Forward and the work of the 2030 group, have envisioned a region that is more accessible, prosperous, sustainable and livable. Metrorail congestion in 2040 with and without all eight-car trains. Metro is planning to alleviate these crowded trains and platforms by investigating the potential of running 100% eight-car trains, among other options. This option would require not only planning, but at the very least purchasing more cars, finding places to store and service these cars, and upgrading our power network to power the vehicles. Going “All 8s” is a major capital investment, which includes power upgrades, vehicle purchases and storage facilities. Additional operating (recurring) costs are also associated with running all 8-car trains, including increased car maintenance staff and additional power. 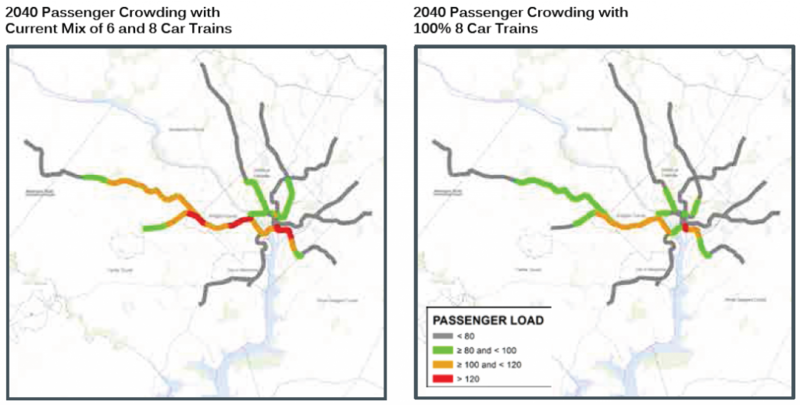 If we can reach this goal, each of the current six rail lines entering the DC core in the peak direction could handle a huge volume — upwards of 20,000 passengers per hour, up from between 14,000 to 17,000 depending on the line. Even with the growth expected through 2040 this would mean much less severe crowding than would occur without those additional cars. 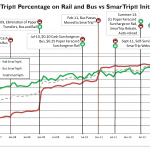 The graphic on the right, above, illustrates the additional system throughput provided by running 100% eight-car trains. To read more about Metro’s future and join the conversation, visit www.wmata.com/momentum. This great video shows one day’s worth of Metrorail, Metrobus and DC Circulator moving across the region.Metrobus and Circulator are both shown as white dots, while the Metrorail dots are keyed to line color. The video should be viewed in full screen mode in order to really see Metrorail. This video was created using the data from the Metro GTFS data feed by STLTransit, who have made similar videos for a variety of other cities. A recent analysis of 5 years worth of ridership data has shown the impacts of the economic downturn and subsequent recovery on Metrorail and Metrobus ridership. 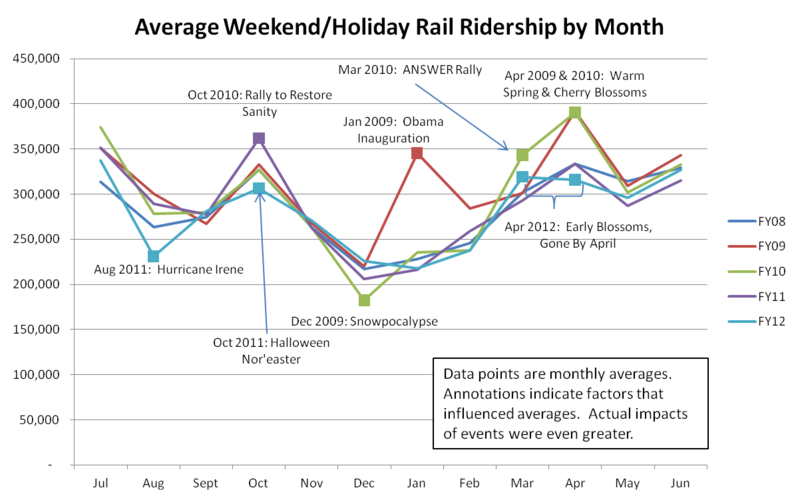 Metrorail ridership experienced a 2% drop in ridership in FY10 and then recovery in FY11 and FY12, 1% below FY09 levels. 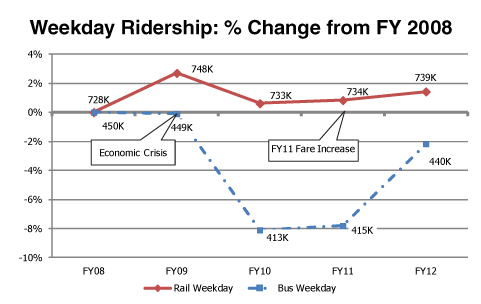 Metrobus ridership experienced an 8% drop in FY10 and began recovery in earnest in FY12, returning to just over 1% above FY08 levels.